The blue blazer. A sartorial workhorse so ubiquitous and universal that it can be easy to take for granted. The well-cut blazer is everything good tailoring should be: elegant, unassuming, and reliable. Such a stalwart companion isn't something you want to cut corners on, and now, there’s never been a better time to get this quintessential coat made for you without breaking the bank. With a formality falling somewhere between a suit and a patterned sportcoat, the blazer is an extraordinarily versatile garment, conferring class when dressed up with trousers and a tie or calling on its military/athletic heritage to give a more casual, recreational pairing with open collars, denim, and even shorts. Any given blazer can be nudged up or down the dressiness scale — and toward one season or another — by careful selection of its elements and details. We’re pleased to now offer your own made-to-measure blazer for under $1,500, available in a few select cloths. We make it with a lightweight full-canvas construction so it molds to your body over time, or in a relaxed unstructured model for unparalleled comfort. Either way, we hand-tailor the garment where it counts – setting the sleeves with silk thread for extra range of motion, and hand-finishing the lapels, pockets, and buttonholes. Choose two or three buttons with notch or peak lapels, (or double-breasted peak to make a statement), open-patch pockets or flapped pockets cut straight or slanted. It’s our way of offering a hand-up into the world of fine tailored clothing. Slanted flapped pockets, and gunmetal blazer buttons. While the classic dark navy cloths are always on offer, we lean towards richer blues that enliven the features of most men, while standing apart from the prep-school blazers of old. We’ve chosen three cloths to offer at this special price. Our favorite is a three-season number that maximizes comfort without sacrificing drape. Its rich blue packs a bit of punch, yet looks downright classic with the right pairings. The second cloth is also a hopsack-like weave in an even lighter, textured 8oz. wool, woven with lighter blue yarns in the weft that add depth to the cloth and render the jacket a bit more casual. Finally, our workhorse navy plain-weave is made from a 9oz wool and mohair blend that wants to be taken a bit more seriously, and lends itself best to more traditional business attire. Our intention is always to design a garment with the right proportions for you, to make you look your best while outlasting whims of fashion. 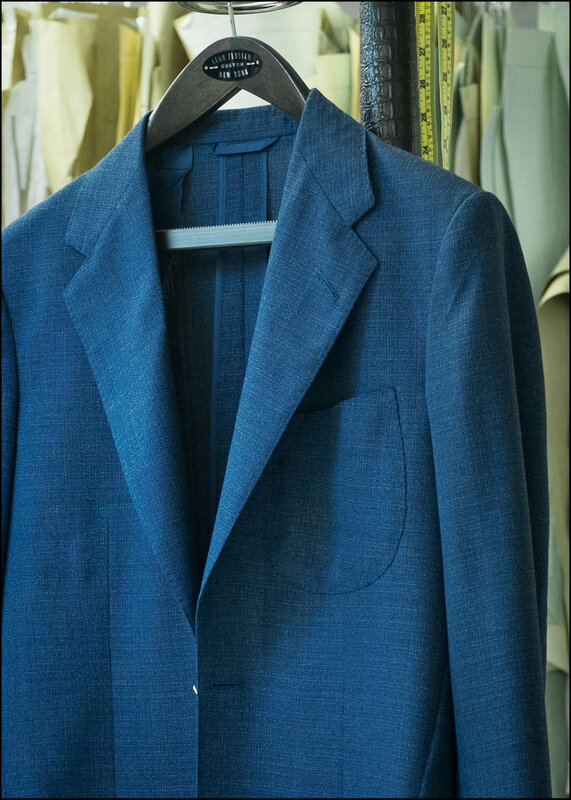 The length of the jacket, width of the lapels, and the placement of the pockets all affect the finished look, and we give the same amount of time and guidance in this aspect as when we sit down to work through a bespoke order. Our house cut has a high armhole, a bit of drape in the chest and back blades, and a soft shoulder and canvas that molds to your body. A double-breasted blazer might cut a more rakish figure, but for precisely that reason most men find the single-breasted version more wearable. Alternatively, the inherent informality of a blazer can be heightened with open patch pockets and soft construction, thus our fully unconstructed model suits those seeking as slack a jacket as possible. Dropping the interior canvas and shoulder padding in favor of lightness and comfort, it hangs on the wearer almost like a second shirt. More than any other element, a blazer’s buttons determine its character. Shanked brass buttons are the most traditional, but many find them a bit too patrician. Gunmetal buttons are a more subtle dressy option that also happens to pair perfectly with the workhorse worsted grey trouser. Brown horn, favored by the Italian set, is even more casual and is best-paired with a more textured cloth worn often with khakis or jeans. (Blue horn should be avoided lest the navy jacket be mistaken for a suit orphan). Whether you’re new to fine tailored clothing, or just never got around to getting this staple into your rotation, it’s a good time to add some pedigree to your wardrobe while enjoying the inherent elegance of a dress-up or down jacket for all seasons. The unconstructed model with no interior canvas and no shoulder padding for unparalleled comfort. The workhorse year-round 9oz wool and mohair. The unconstructed breezy 8oz hopsack. Classic blazer buttons, hand-sewn lepels and buttonholes, 1/4 lined and piped seams with red bemberg on the year-round 9oz wool and mohair.